Q: Hello Zine, thanks for your time! Yole says that Micro-LED display technology is not yet ready... but you see progress on all fronts. What are the main challenges still to be overcome in this market? As has been discussed for some time now, the assembly process always appeared to be the most daunting one. Recently, however, we have seen some assembly technologies delivering close to 99.99% or even 99.999% yields. Assembly is still a major challenge, but we are seeing some very encouraging rapid progress. Effort is still needed on many of the technological components required to manufacture a proper microLED display: color conversion, light management, driving, and many others. We think some of these challenges have been overlooked because everybody focused on tackling the assembly problem first. Q: Will Apple indeed be the first company to introduce micro-LED displays in mobile devices commercially? It really feels like Apple could lead on the mobile devices front. By carefully analyzing their patent portfolio, mainly built upon the acquisition of Luxvue in 2014, Apple’s portfolio is one of the most complete, comprehensively covering all critical technologies pertinent to microLEDs. And as explained above, there are many technological components to take care of in order to be able to deliver. Speculation has always been around Apple releasing a microLED based smartwatch as it appears to be the lowest hanging fruit of the microLED disruption, but there seems to be, once again, many issues to resolve for microLED displays in mobile devices. Q: What is your view on Samsung's Micro-LED projects? Are their Active-LED and "Wall" displays considered to be Micro-LED displays? Samsung has pulled a nice marketing stunt by announcing at CES 2018 their “microLED” TV. It is indeed self-emissive and uses LED-based chips for each sub-pixel, but dimensions are actually much larger than what are considered to be microLEDs. This is reflected in the technical challenges and the overall price of this TV. They actually used miniLEDs, a recent LED industry term which, in terms of LED manufacturing technologies, might require some incremental improvements and innovation, along with minor additional CapEx. But overall, unlike microLEDs, miniLEDs do not constitute a major disruption and can be produced in existing LED fabs. Now there are rumors of real microLED TVs (i.e. die < 50 um in size) being assembled by Samsung in partnership with PlayNitride. Q: Two of the most interesting markets for Micro-LEDs are the AR and VR markets. How do you see Micro-LED penetration into these markets? We think that AR and VR should be tackled separately, because challenges and requirements are very different for each application. In VR there is little need for a very high brightness display as you are isolated from the outside world. Therefore, we do not foresee a huge penetration of microLED displays for VR, especially since VR headsets somehow need to keep costs under control. On the contrary, AR needs to work everywhere, and you need your computer-generated image to be visible under any lighting condition. Given the fact that AR will most likely thrive on waveguide-based technologies which have poor optical efficiency, this is going to require a display source with very high brightness. MicroLED displays could really be an enabling technology for this disruptive application, offering the unique combination of brightness, efficiency and form factor that AR requires. We see this as one of the first applications, after the above-discussed low-hanging fruit of smartwatches. Q: Micro-LEDs are not suitable for all applications (for example the smartphone market will probably be a great challenge). Where do you see Micro-LED displays being adopted within 3-5 years? We can see hints here and there in the previous discussions. We see the first adoption occurring in small pitch large video displays where larger dies (around 30 µm) could be used, and it would still allow significant improvement in contrast. Actually, such products have been available from Sony for a year now, with their Crystal LED videowalls! Even though the cost is still high, in the midterm it has the potential of significantly reducing the cost of such small pitch LED videowalls as the use of microLEDs enables both package- and chip-size cost reductions. After that we see adoption in smartwatches and other wearables, and AR solutions. 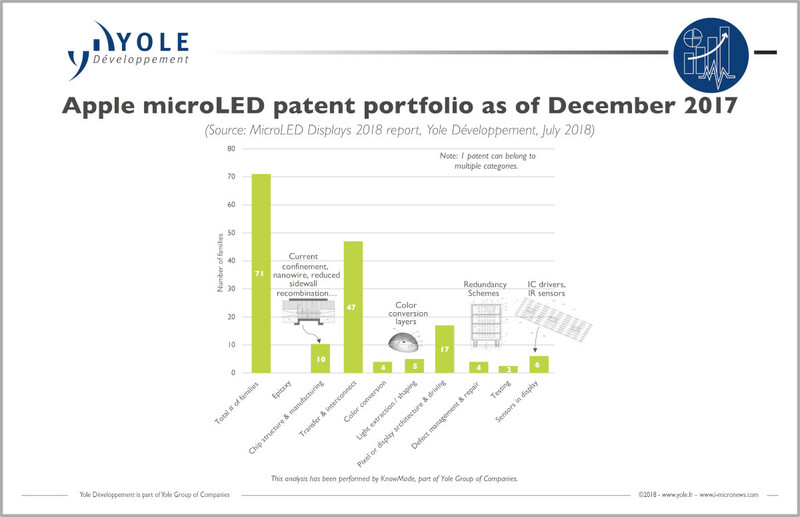 Q: Do you think Micro-LEDs can compete with OLEDs/LCDs in price for small wearable displays and microdisplays? In terms of costs, the task may seem daunting for wearables, because OLED is already dominating the smartwatch, and panel costs are quite low. If you compare the situation for smartphones, you see that a regular rigid OLED panel is almost the same price as an LTPS LCD one, for example. OLED is thriving and microLED displays may have to face this challenge when entering the market. We think microLED will have a very hard time matching the cost of OLED. To succeed, it will have to offer differentiating performance, or functionalities that no other display technology can offer. For microdisplays however, as previously discussed, microLED displays could be an enabling technology; the market disruption could be such that even though cost could and/or should be higher, this would be less of an issue. Thank you Zine for your time and insights! 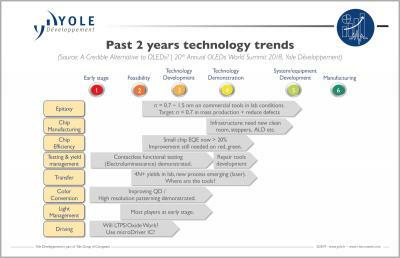 Good luck to you and hopefully we'll keep hearing Yole's opinion and forecasts for the Micro-LED market.